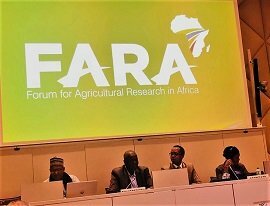 The Integrated Agricultural Research for Development (IAR4D) concept was developed and proposed by FARA to overcome the shortcomings of the linear approaches for implementing agricultural research and development. The IAR4D concept appraises agriculture as a system that is made of many sub-systems that must work together to foster development. Thus it engages all actors, organizations and institutions that are involved in the agricultural sector to interact and jointly foster the development of the sector. IAR4D uses both the system and the commodity approach, and engages all actors along the commodity value chain, including external actors like policy makers, financial institutions, meteorologist, insurance etc. that influences the chain to interact and proffer solution to the jointly identified constraints on the platform. The IAR4D concept sets up the Innovation Platform (IP) as its operational instrument. The IP is a forum for group of relevant actors selected along the value chain of specific commodity or system of production. The actors include farmers, researchers, extension agents, traders, processors, financial institutions, policy makers, regulators, output market operators, consumers and others. They interact to jointly identify problems, investigate solutions leading to generation of innovations and its accompanying socio-economic benefits. The impact of carrying out agricultural research and development activities using the IAR4D concept is derived from the complementary effect of the different competences of actors on the IP. Essentially all actors on the platform must have a contribution to make and a benefit to derive from the activities of the platform. This will sustain their continuous involvement until innovations that benefit allare generated. Research activities on an IP are all encompassing, covering natural resources management, productivity, market, policy, product development, nutrition and gender. These activities will often yield technological institutions which are complemented by institutional and infrastructural innovations leading toaccelerated socioeconomic benefits, including poverty reduction among the smallholder farmers. Although agricultural activities take place on the field and mainly in the rural areas and remote locations, it is governed and managed by policies and decisions made both locally and at the center. Innovation platforms are therefore required at different levels of management and governance related to agricultural development. In general terms IPs are required at both strategic and operational levels. The IPs at the strategic level are platforms set up at higher governance hierarchies to design strategies for agricultural development at their domain of governance. The strategic IP engages chief executives of the different stakeholders’ organizations in the country’sagricultural sector and discuss strategies to promote innovation along targeted commodity or systems. They also facilitate the set-up of operational innovation platforms. The operational innovation platforms have a different focus, although they source membership from similar organizations as the strategic IP. The calibers of staff that they engage are frontline individuals who could facilitate the operations of the IP and have the mandate of the chief executives to do so. The operational IP work is aligned with market end and they work on an identified commodity to meet the market demand. IAR4D simultaneously addresses research and development as a fused continuum for generation of innovation. All stakeholders on an IP have a contribution and benefits which sustain their interest and continued participation. Innovation generated using IAR4D will benefit all stakeholders on the platform. IAR4D engages the policy makers at different levels all along the process of R&D till innovation is generated. e). IAR4D demands investment by partners, which is followed by returns on the investment. f). IAR4D ensures a smooth public-private partnership in ARD. All inclusive partnership arrangement to address technological and non-technological issues. IAR4D links all kinds of research endeavors (blue sky, strategic, basic and adaptive research) for the benefit of the farmers. IAR4D ensures an effective engagement and capacity strengthening of the NARS.